It's been a big year for Jazz North East as they celebrate an extraordinary 50 years of promoting live music. Their energy hasn't waned in those 50 years and 2016 has been another jam-packed year of performances for the organisation. As their 50th birthday year draws to a close, they have set up a very special gig to round it off which takes place on December 13th at the Black Swan in Newcastle. Who'd have believed it? 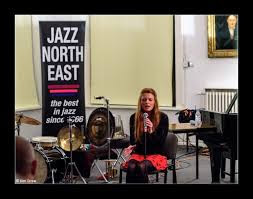 Started back in 1966 with a concert by Earl 'Fatha' Hines, this year Jazz North East has been celebrating its 50th birthday. And we couldn't let our special year come to a close without putting on something really extra special. Early in the year we decided that we wanted to create an entirely new band drawing on some of the most imaginative improvising musicians across the North, and we came up with a 12-piece line-up that must surely be unique in its composition, with theremin, violin and vibes sitting alongside the more conventional horns and rhythm section. Add Zoë Gilby's amazing vocal talents, and we have an orchestra with extraordinary creative potential. Then, to make the best of that potential, we commissioned music from Graham Hardy, Corey Mwamba, Roller Trio's James Mainwaring, and the collaborative pairings of Faye MacCalman & Graeme Wilson, and Zoë Gilby & Andy Champion, giving us five new compositions reflecting the five decades of our existence. The orchestra have been rehearsing and refining the music since September, and now, for the very last concert of our anniversary year, everything will be revealed in all its remarkable glory! But why the 'Fluid' Orchestra? Well, in part because we believe that the instrumental combination allows for an unprecedented flexibility, fluidity, in approach. But also we're so excited by the project that we hope to keep this going in future years, although probably with evolving changes in personnel to stimulate new creative challenges. It's a fluid concept, and it starts right here at the Black Swan. For more information, visit the Jazz North East website.